At first look I assumed this was the mousetrap, but maybe it is Colfax as Hugh suggested. The CDOT actually counts cars and if I’m reading the tables correctly the average daily traffic at the Colfax exchange is 206,000 cars a day! Yes, the barnes dance is a great denver story – one that we’re hoping to feature in a future post. 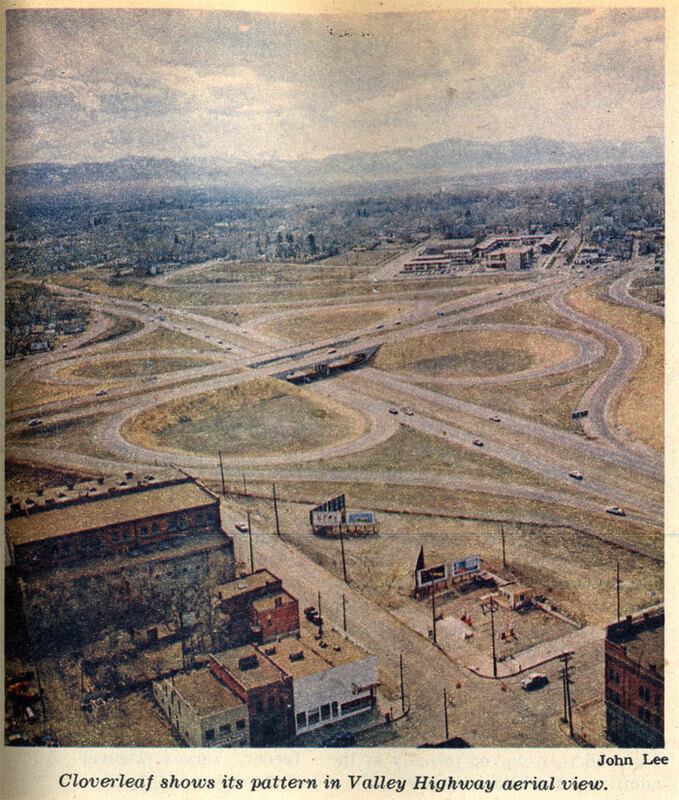 When I-70 was completed, my family lived in north Denver near the original Elitch Gardens (my mom still lives there.) My dad was a chemist at the Rocky Mountain Arsenal (now a superfund site/nature preserve). He remembered taking the new highway at seven in the morning for the first time — heading east, taking, I imagine, the Lowell Blvd. or Tennyson on-ramp, on the new highway to the Havana exit. His was the only car in sight. Needless to say, this changed. I’m almost positive that picture is looking southwest over Speer Blvd. The hotel and gas station on the upper right are still there. Fred, I think you are right. Good eye! That’s the denver tramway/forney museum/REI on the bottom left. The building that is now brothers bar was two stories then, that threw me off. Fred, I can’t believe i didn’t see it before, it’s so clear now that I see it! Would the hotel be the old Continental (at the top of the picture)?